In 2001, The Wall Street Journal’s headline read: “Is Felix Dennis Mad?” Some people thought the British publisher was nuts for launching his U.S. version of THE WEEK magazine. Fabled titles were struggling, but Dennis didn’t care. Dennis overcame odds and misbehavior that would have crushed most people. He whipped drugs and booze, but he couldn’t conquer his throat-cancer battle. From the time he dropped out of high school at age 15 to become a grave digger, Dennis was clawing his way up. Over the next half-century, he went from dead broke to dead in a grave, leaving an estate worth hundreds of millions. Outrageous and flamboyant don’t adequately describe his never-ending antics. Still, he was a business-minded genius. The only way I was exposed to Felix Dennis was through the every-seven-days arrival of THE WEEK. His byline—as far as I can remember—never appeared. What I know about him came from his you-can’t-make-this-stuff-up obituary in his magazine’s July 4 edition. From the first time I picked up THE WEEK, I was hooked. And when I am stumped buying gifts, I’m apt to give a subscription to this clever magazine. TV news hasn’t been a regular on my schedule since Walter Cronkite, Chet Huntley and David Brinkley left the air. My preference is a heavy diet of reading material that I can fit into my schedule. One of the things that I like most about THE WEEK is that I can—in a glance—see if I missed anything important. In less time than a 30-minute news program, I make a quick lap around the globe. And what’s really nice, I can carry THE WEEK with me and squeeze in five minutes here and there. I don’t have to sit in one spot to get a dose of information. I remember the first time I went to Morrison’s Cafeteria in Savannah. I had never seen such a spread of edible choices. THE WEEK is a 40-page smorgasbord. If you want to skip liver and onions—aka Vladimir Putin—and opt for strawberry shortcake, reading about Jennifer Lawrence and Hollywood gossip, you can fill your plate the way you like it. 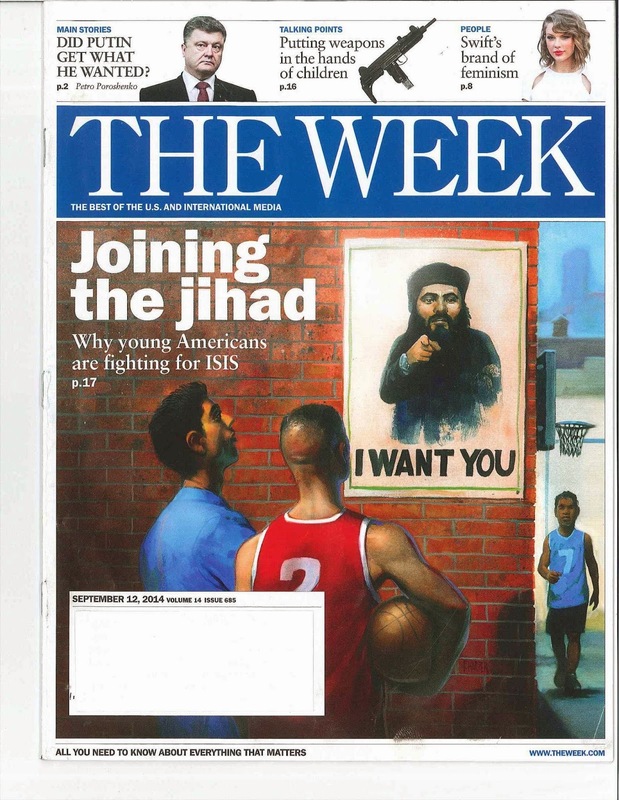 There’s plenty of variety, including the “Controversy of the Week.” The Sept. 12 edition devotes a half-page to the debate of “Taking on ISIS: Does Obama have a strategy?” THE WEEK does a good job of presenting opposing views, letting you decide which argument makes the most sense. Want to receive Dink's weekly column by email? Dink NeSmith 2014 ©. Simple theme. Powered by Blogger.